From the Hancock County Courthouse, travel 2.7 miles northeast on Hwys 15/22 to the Hwy 15 and 22 split. Turn right on Hwy 22. Follow Hwy 22 for 5.0 miles to Covey Rise Farm Rd. Turn right and travel 1.9 miles to the farm on your left. Drive to the house and then turn right onto a field road. 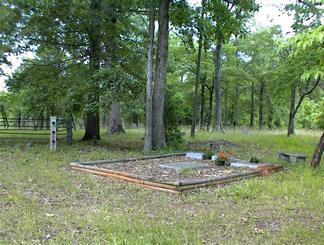 The cemetery is 0.1 mile from the house on the left side of the field road. b. Birmingham, AL. d. Covey Rise Farm. Author, Writer, Foreign Correspondent. "Beloved Husband and Father lies here with his dear 'friend' Sam." "Beloved wife of John and mother of Meta, Frances, and John Jr.
4 graves within an enclosed fence and marked by stones. 2 graves surrounded by bricks. 5 graves surrounded by bricks. 3 mounds of rocks may mark graves. Mounded stones next to the dogs' graves.